Around the majestic Lake Atitlán sits the small town know for its traditional weavings, San Juan La Laguna. I was graciously invited to learn about the weaving process from two borrowers who are part of the women’s cooperative Asociación Tz’utujil. Tz’utujil is the Mayan culture and language of those inhabitants who live around the lake. One Saturday morning, I took the 30-minute boat ride across the lake to see how this cooperative makes their weavings (scarves, table runners, shawls, bags, hammocks, etc.) from start to finish. 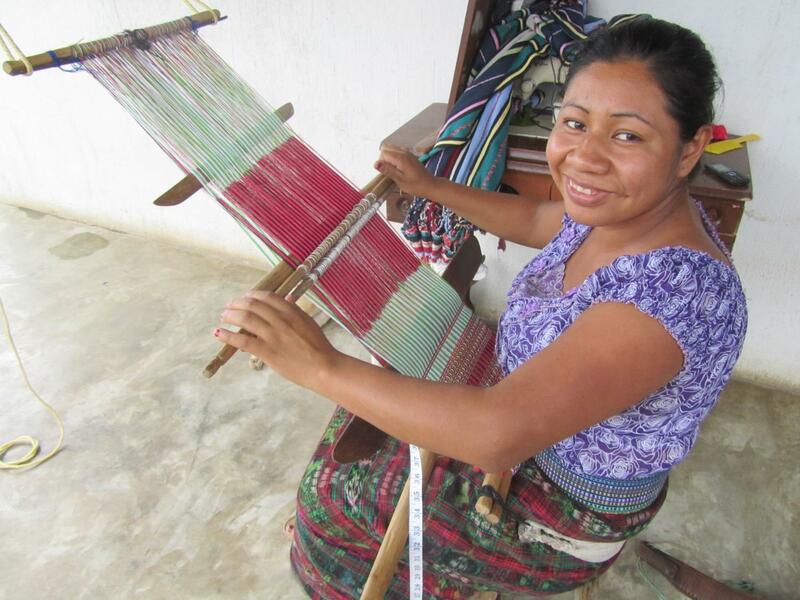 Maria Gloria, president of the cooperative, started the process by dyeing the thread. Depending on the desired color, different plants, leaves, bugs, and vegetables to create the dye. For example, carrots make orange, beets make purple, coffee plant leaves make green, coconut shells make peach/brown, cochineal insects that lives in cacti make pink, and leaves of mujer de monte plant make red. 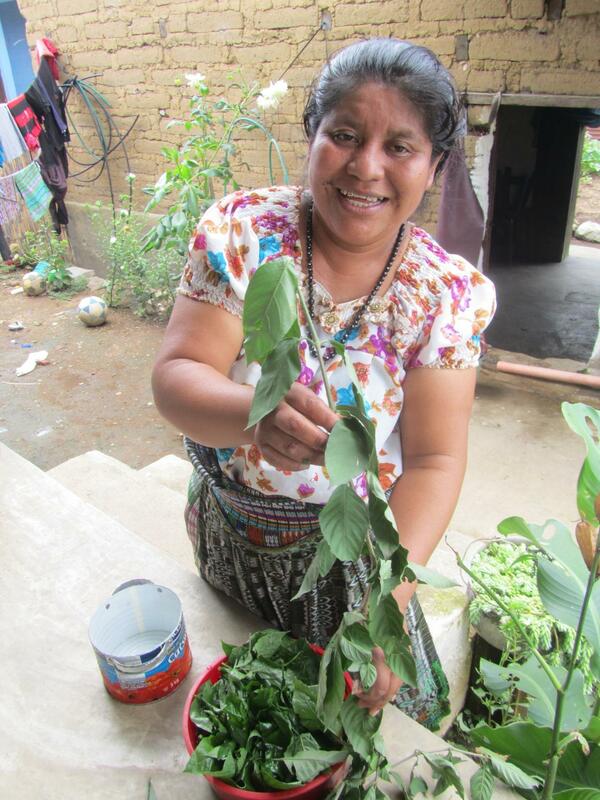 Maria Gloria chose the dried leaves from the sacatinta plant that she grows on her property to save money. She crushed the leaves, placed them in water, and then boiled the leaves and water for 30 minutes. While the leaves and water boil, Maria Gloria soaked the white cotton thread and added a chemical powder to help ensure that the thread absorbs the color and doesn’t bleed. After boiling, the leaves are strained from the water. 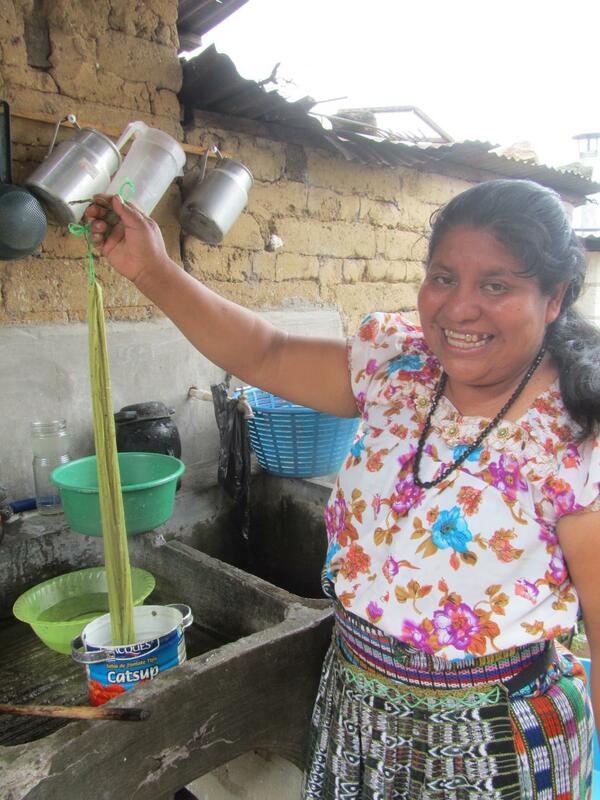 Maria Gloria immersed the thread into the water to begin dyeing. She explained that depending on the season, the color that the sacatinta dyes the thread differs. If there is a lot of rain, the sacatinta turns the thread a light blue because the leaves hold a lot of water. However, if it is a dry season, the sacatinta turns the thread a grey color. After dyeing, the thread is washed with soap before hanging to dry. The next step is to decide which threads will be used for the weaving, measure the size of the weaving, and prepare the thread before it is placed on the loom. This process can take up to two hours. The threads are crisscrossed in some sections and overlapped in other to make introducing the sticks of the loom easier. 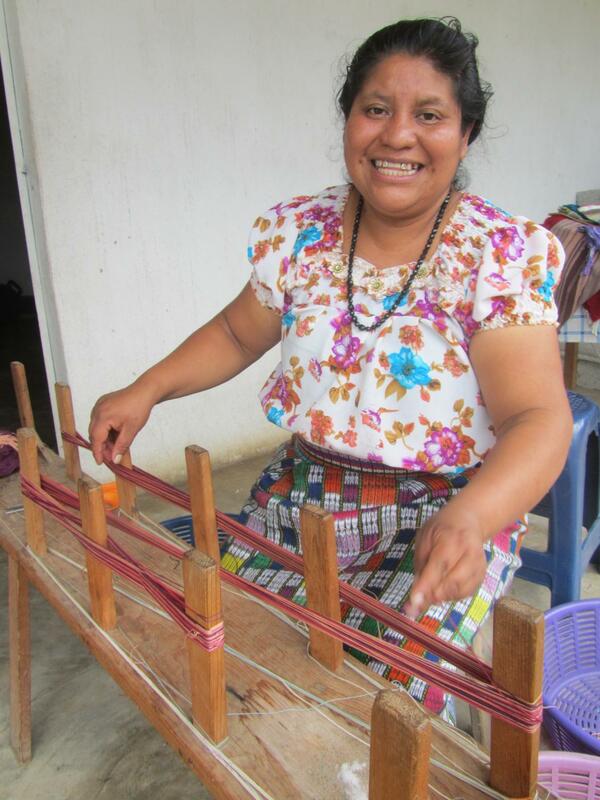 Aura, the treasurer of the cooperative and twenty-six year old mother, demonstrated the backstrap loom weaving. 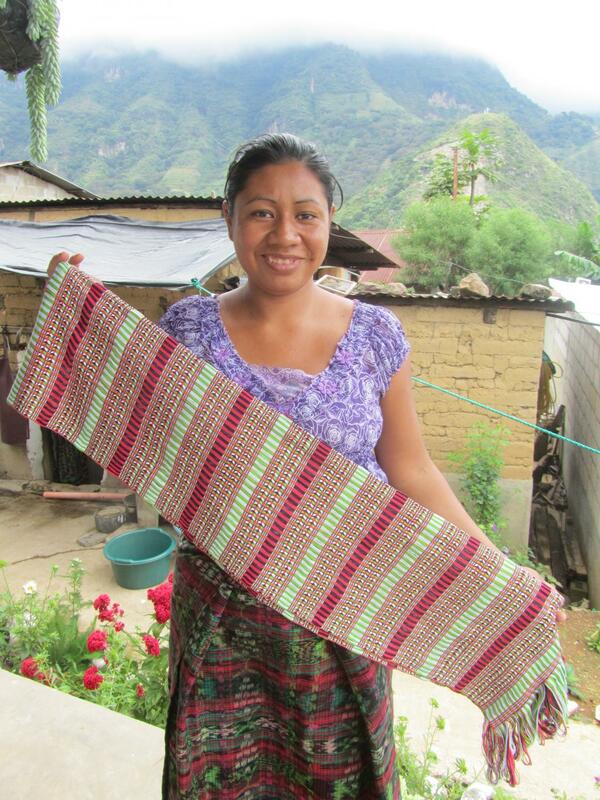 Her mother taught her how to weave when she was eight years old. 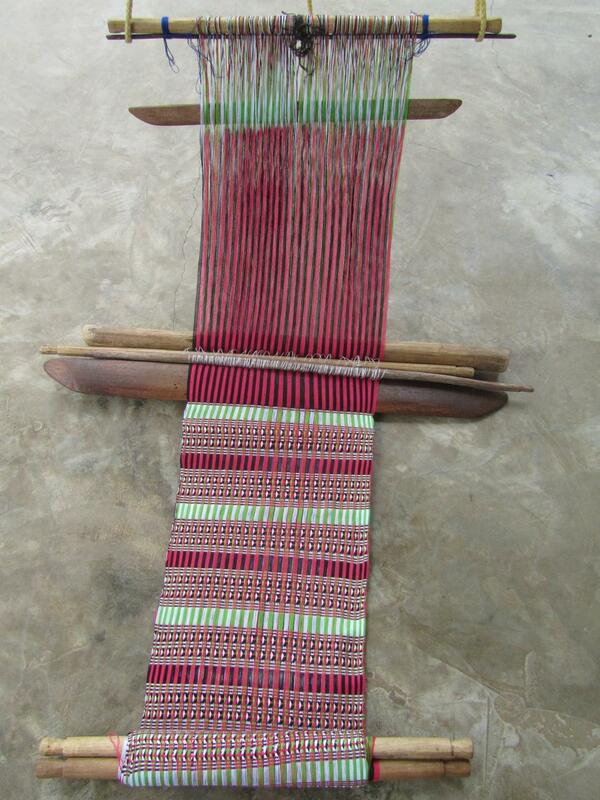 Aura was weaving a scarf and said it takes her about six hours to complete the entire weaving. The top end of the weaving hangs by a wooden stick from a rope in the ceiling and the bottom end sits on her lap and is wrapped around her waist with a belt. Asociación Tz’utujil sells their products to consignments in Antigua and Guatemala City, as well as around Lake Atitlán. With the cooperative’s earnings, the money is reinvested to purchase more thread and to obtain certain plants and leaves that are farther away or harder to find to dye the thread. The net profit is divided among the 15 members. Asociación Tz’utujil hopes to open their own store in the market to reach more clients and to have their own space to work together instead of working out of their individual homes. 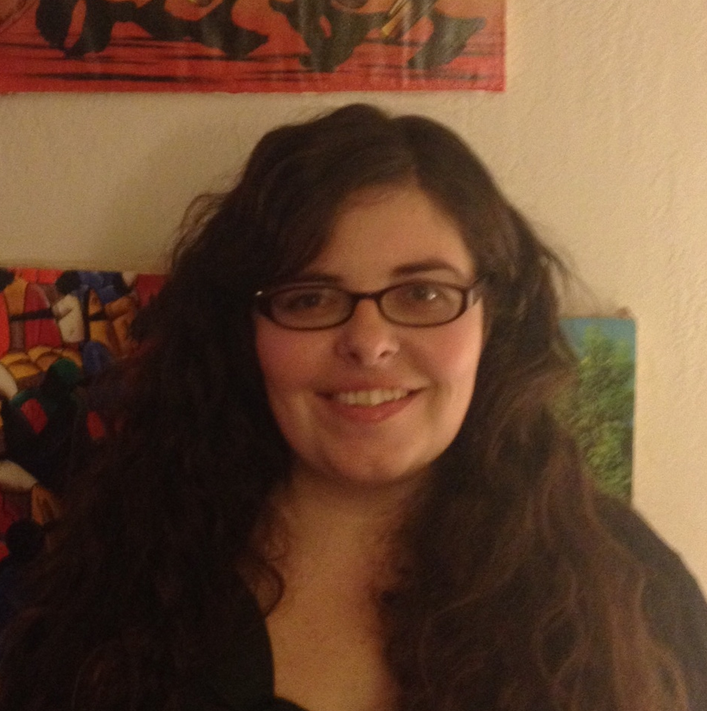 As for Maria Gloria, her earnings help support her family and her two children’s education. As Aura is a single mother, her earnings help to raise her son and to pay for his education. She dreams of building her own house one day. It was a beautiful day spending time with these two women and learning about their traditional weavings.